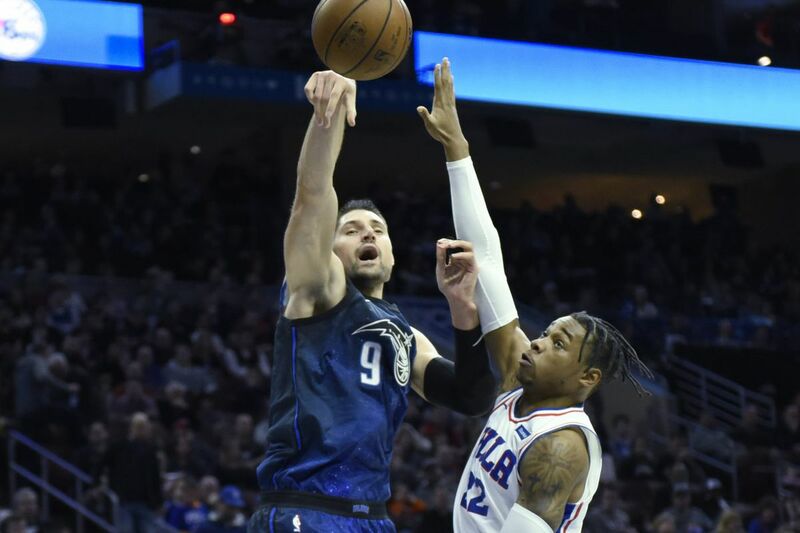 Sixers big man Richaun Holmes contests Magic center Nikola Vucevic, a former Sixer, during Philadelphia’s win on Saturday. Here are my key takeaways and "best" and "worst" awards from the 76ers' 116-105 victory over the Orlando Magic on Saturday night at the Wells Fargo Center. — The Sixers are in the midst of doing something they haven't accomplished in nine seasons. Saturday's victory gave them a seven-game winning streak for the first time since January, 2009. It's also the NBA's second-longest current winning streak behind the Houston Rockets at 11. — Joel Embiid had 28 points and 14 rebounds in what was his 22nd time this season with at least 20 points and 10 rebounds. That ranks fifth in the NBA behind the Milwaukee Bucks' Giannis Antetokounmpo, Minnesota Timberwolves' Karl-Anthony Towns and the New Orleans Pelicans' Anthony Davis and DeMarcus Cousins. — Finishing with 11 points, Dario Saric extended his career-long double-digit scoring streak to 37 games. He becomes one of 18 NBA players to score in double figures for at least 37 games. — The Sixers are hard to beat when shooting the ball well. They shot 51.9 percent on Saturday and improved to 12-2 in games when they shoot 50 percent or more. —Richaun Holmes, once again, provided a spark when called upon. In what was just his 29th-game appearance of the season, the reserve center finished with four points on 2-for-3 shooting, eight rebounds, four assists, one steal and one block in 21 minutes, 3 seconds of action. — Best performance: It would be foolish to not give this to Embiid. In addition to his game highs in points and rebounds, he also blocked a shot and had zero turnovers. — Worst performance: This was a tough one, but I'm giving this to D.J Augustin for basically just being out there. The Orlando point guard only had two assists and one rebound. — Best defensive performance: This goes to T.J. McConnell. The Sixers backup point guard finished with two steals while providing stiff defensive pressure. — Worst statistic: This goes to the Sixers shooting 3-for-13 on three-pointers in the second half. — Best statistic: I gave this to the Sixers shooting 51.9 percent from the floor. — Worst of the worst: I had to give this to Nik Vucevic's disappearing act in the fourth quarter. The Magic center missed his lone shot attempt while being held scoreless in 8:06 of action in the final quarter. He had scored 15 points on 6-for-12 shooting through the first three quarters.